If there was one drawback in owning a cat, that would be the litter duty. It is time consuming, smelly, inconvenient… And it can even be dangerous if you are pregnant or if you simply inhale the litter particles that fly around when cleaning the litter box. 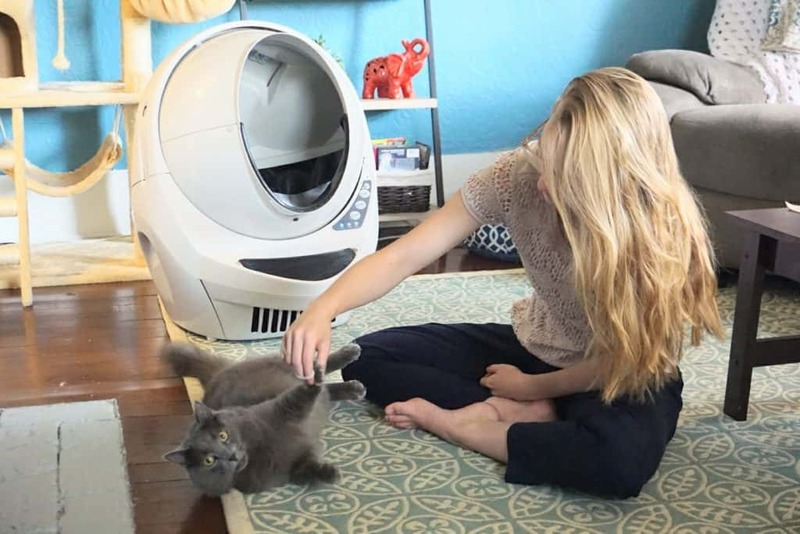 But fear no more Fluffy Kitty reader, we have found the coolest, fastest, most convenient way to take care of your cat’s litter: we present to you the Litter-Robot! If you are as curious as we were when we first heard about this product, then this article is for you. 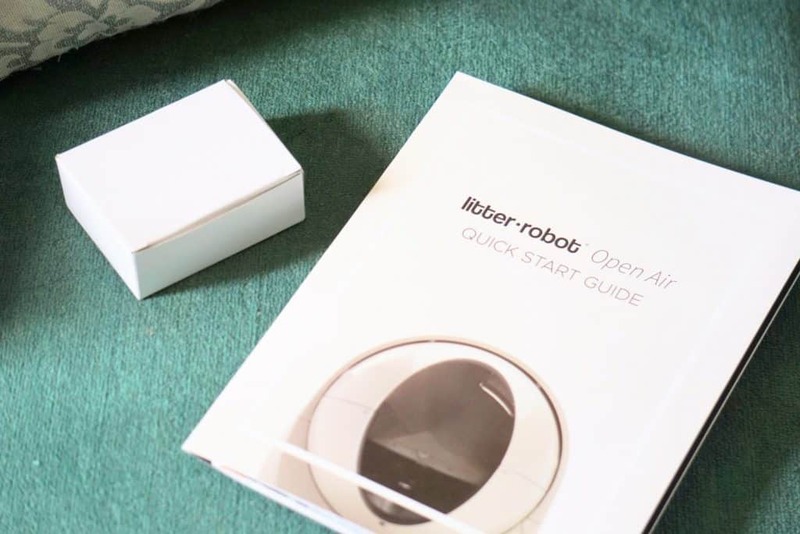 Let’s get this show on the road, let’s get down to the nitty gritty: Here is our Litter-Robot III Open Air with Connect review! The Litter-Robot | What Is It? If you own a gluttonous beast like we do, chances are that you need to clean your litter box more often than you would like. 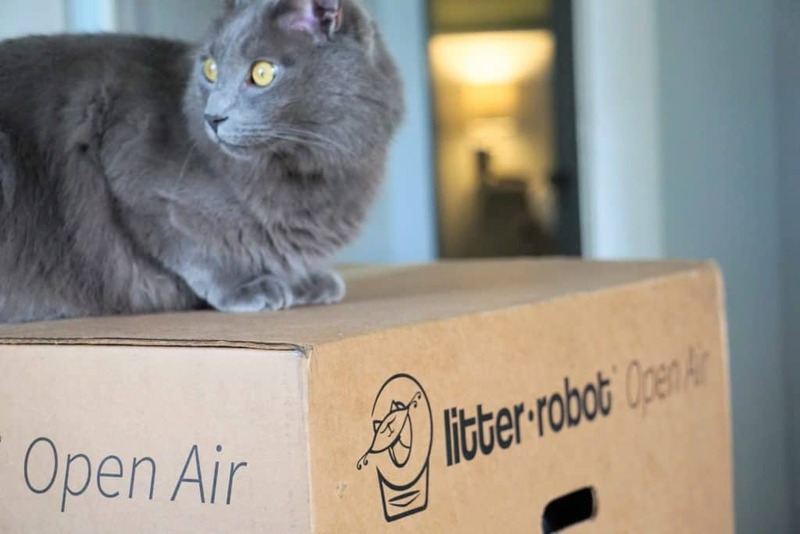 The Litter-Robot answers this need for a simpler, faster and cleaner way to handle your cat’s waste. To sum it up, it makes your life easier! When full, the robot stands on its legs and throws the waste bag away… just kidding, you actually have to do that part. 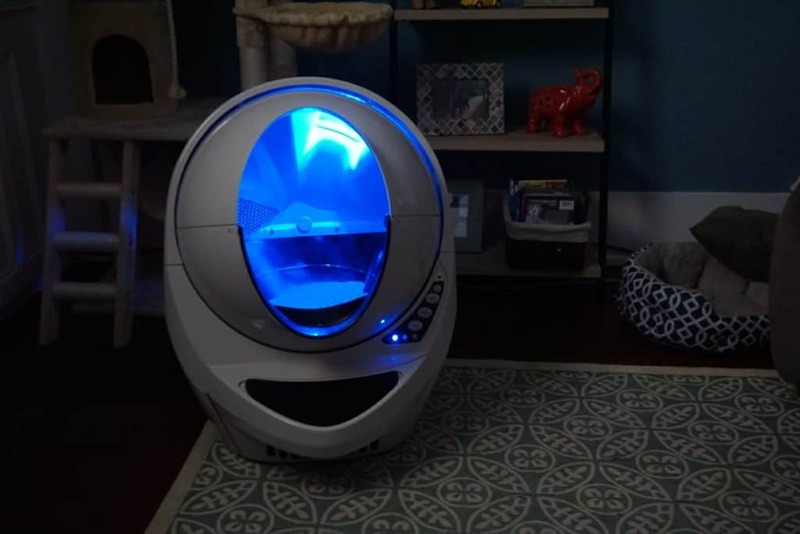 Jokes aside, the Litter-Robot is probably the most advanced self cleaning litter box ever made. Keep reading to discover all its fancy features! Oh how excited we were when receiving our Litter-Robot! The first thing to highlight is the uniquely designed strong box in which it comes. The product is well protected and not to mention it doubles as a huge mansion for your cat. Even though the box is quite big, it is not that heavy and it is easy to carry since the carton box has two holes/handles dedicated for that purrpose. 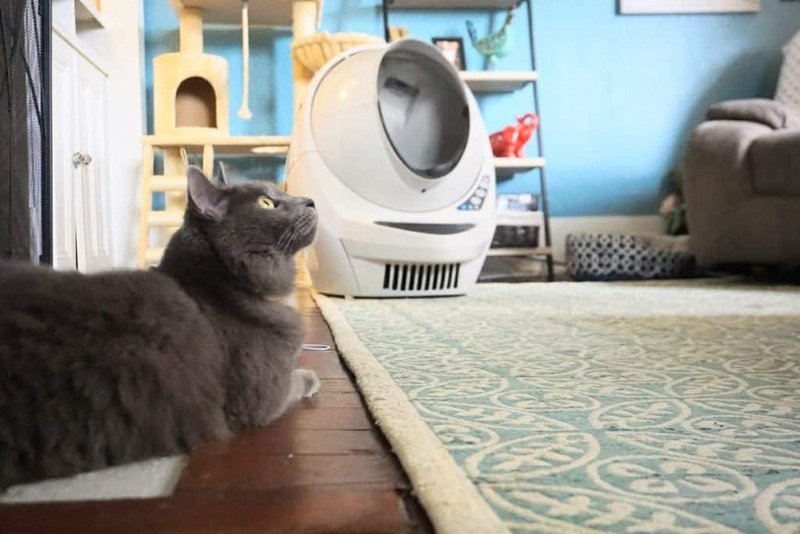 Yoda never had the chance to try a automatic litter box like this one before. If at first we were a bit concerned that Yoda would even take to it, our doubts rapidly disappeared. It did not take more than 5 minutes for him to sniff the robot and realize it was for him. 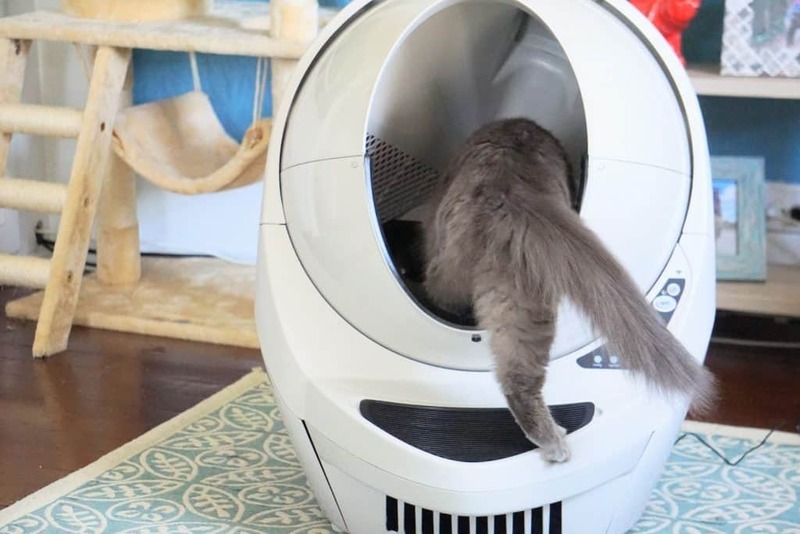 A set of instructions (“introducing your cat to the Litter-Robot”) comes with the product, but we never had to do anything special for him to adopt this new tool. He just jumped in, did his business and jumped out! The set up is really straight forward. 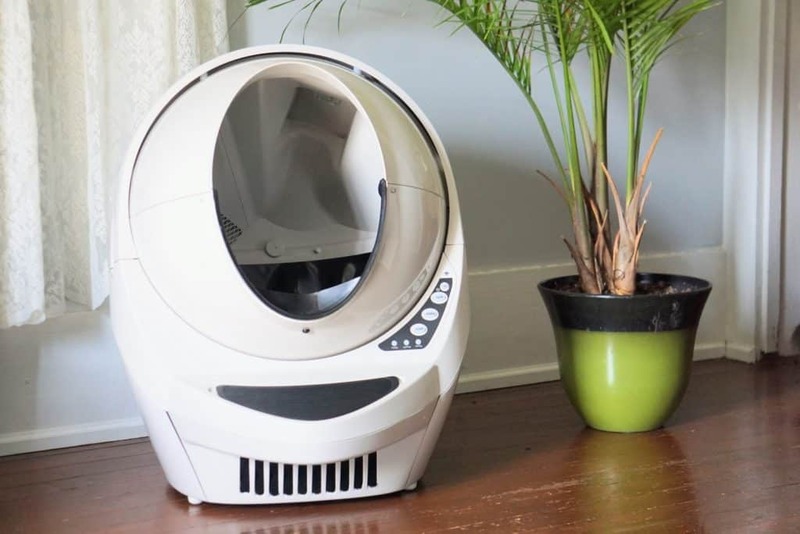 Even if the Litter-Robot looks like a spaceship straight out of your favorite Sci-Fi movie, it is a very user-friendly product and is extremely easy to operate! 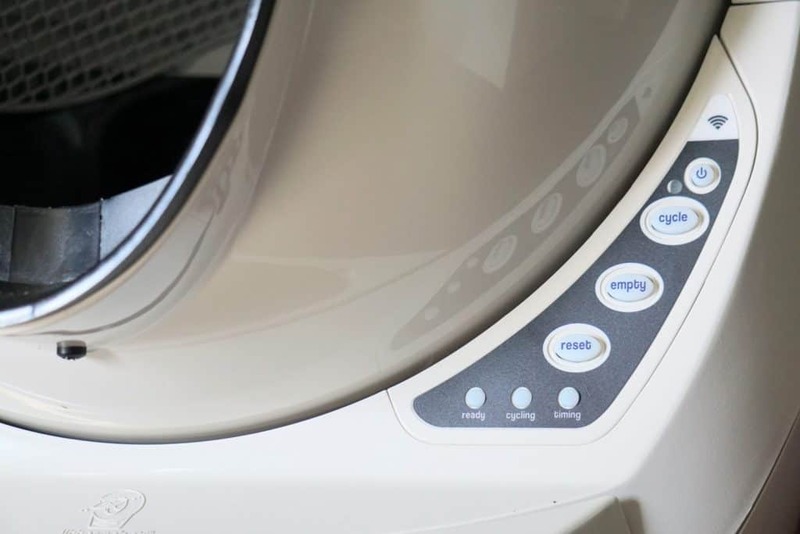 In fact, you simply need to plug it, fill it, and power it for an initial clean cycle and you will be set! There are of course more advanced features like setting the cycling time or connecting it to your phone, but they are pretty simple to figure out. One of the many cool features of this products is that it comes with its own waste level management system. Pretty amazing isn’t it? We sure think so too and we really appreciated the care put in all the small details that make a product so great! Here again, simplicity is the word. Pull out the waste drawer, take the bag out and throw it away. Replace the bag, push the drawer back in and you are done! The Litter-Robot is ready to cycle again! Even though this is super convenient, we are not super fans of the disposable plastic bags, so we hope dumping out the waste, cleaning the bag and reusing it is possible! 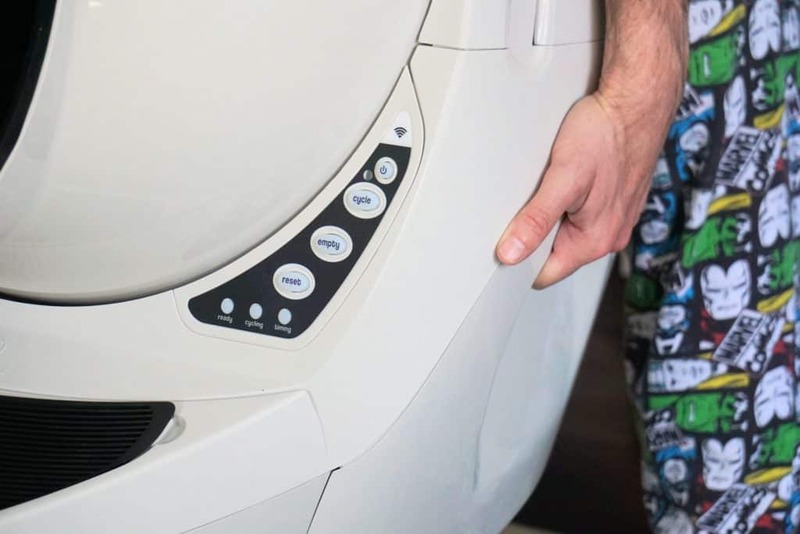 From time to time, you may still need to clean up some more resistant poop stains left after the robot does its cycle (if your cat has a runny poop, for example). In that case it’s still pretty simple. Just use a wet cloth with mild soap. The inside of the globe has no electronic components so it’s easy to clean (and safe for your beast). Behind the Scenes | How Does the Litter-Robot Work? 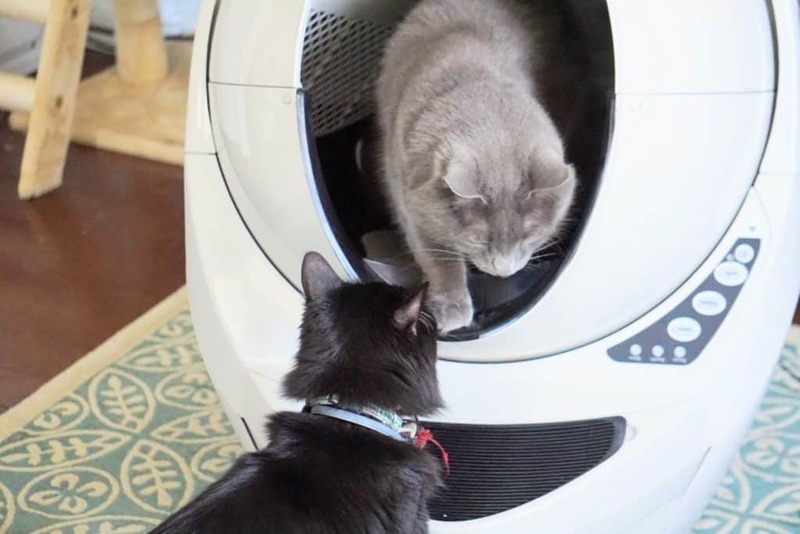 When your cat enters the Litter-Robot, a “cat sensor” is activated. 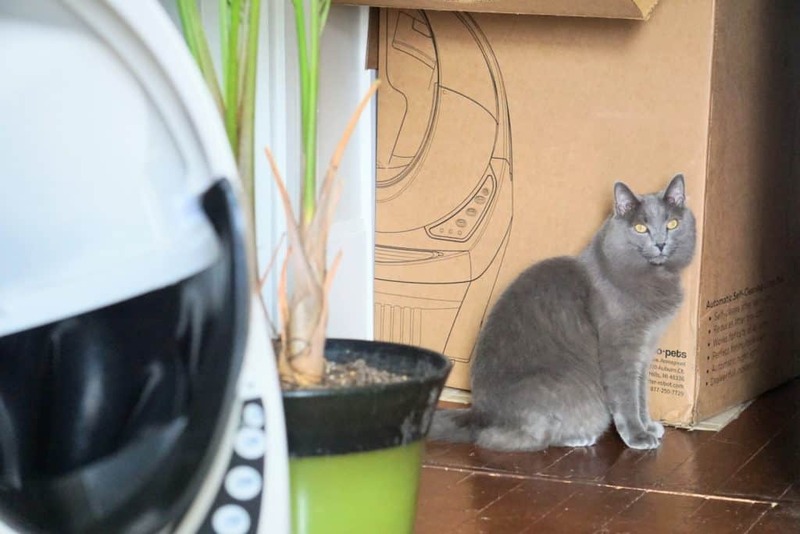 The weight difference is how the robot knows that your cat is in or out. Note that your cat must be at least 5 lbs or more to activate the cat sensor, so the Litter-Robot isn’t ideal for small kittens. When your cat hops out, it triggers a new cycle that starts after a set wait time that you can change (3, 7 or 15 minutes). Ours was set on a default 7 minute cleaning cycle so we didn’t opt to change it. The capsule/globe rotates to filter the waste clumps from the clean litter. This is why it’s important to use clumping litter for the Litter-Robot. When the Litter-Robot rotates and reaches the dump position, the waste slides into the waste drawer. It then rotates back around to fill itself with the leftover clean litter. The clean cycle takes around 2 minutes to complete. Empty cycle: When you want to completely empty the robot, there’s a button that let’s you do just that! Just hit the “empty” button and the Litter-Robot will do the rest. Night light: Yes, you read that right. There is an automatic (blue) night light function for cats who have trouble seeing (that you can deactivate). It’s actually quite convenient if you have it in your bathroom at night. No need to turn on the big light! 8 hour sleep mode: This mode is very useful if you want to prevent the system to run automatically. Let’s say if the robot is in your bedroom and you need it to stay quiet at night, this will be convenient. 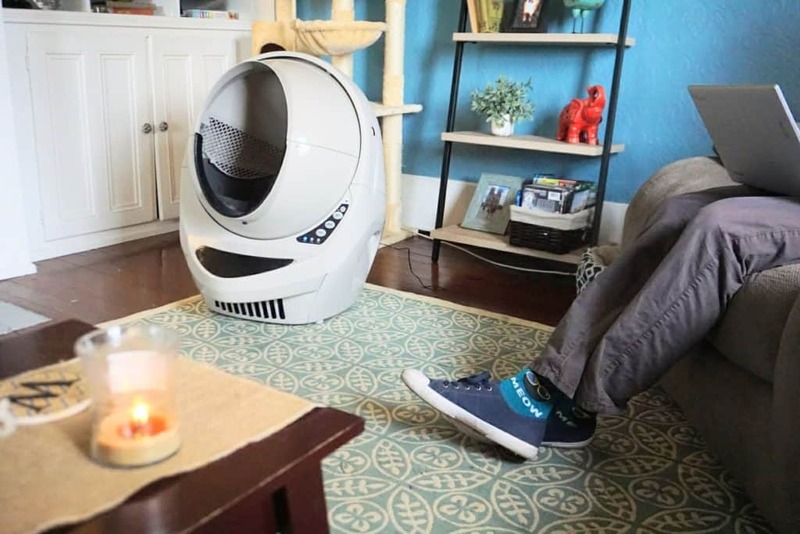 It’s also a good way to introduce your cat to the robot if you think he may get scared by the robot in action after a few minutes. Reset button: This one is just here to make sure the system works properly if you have to move the device or change anything that could affect it’s usual settings. 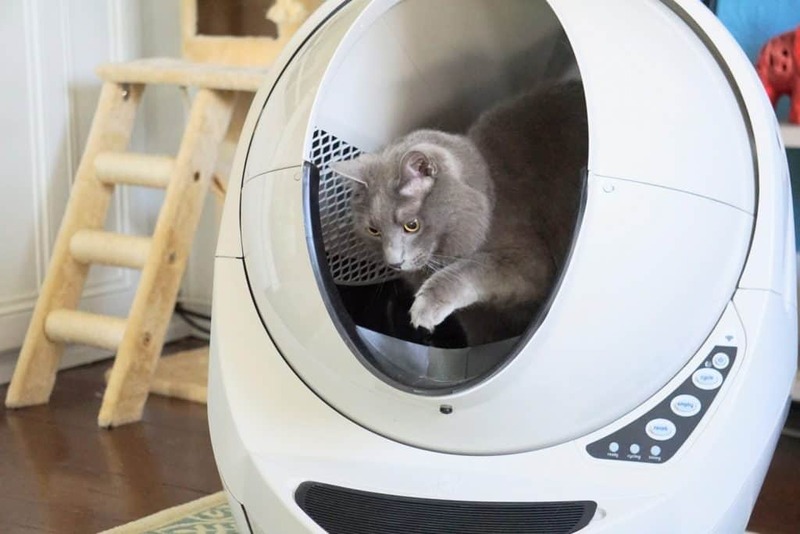 Step mat: A little step that enables your cat to climb gently in the robot. Convenient on the way in, but not so much on the way out as kitty cannot really see it while exiting. Yoda and his current housemates are hopping out instead of using the step mat, which unfortunately tracks litter over the house. If this is the case with your cat, consider getting a cat litter mat to help reduce tracking. 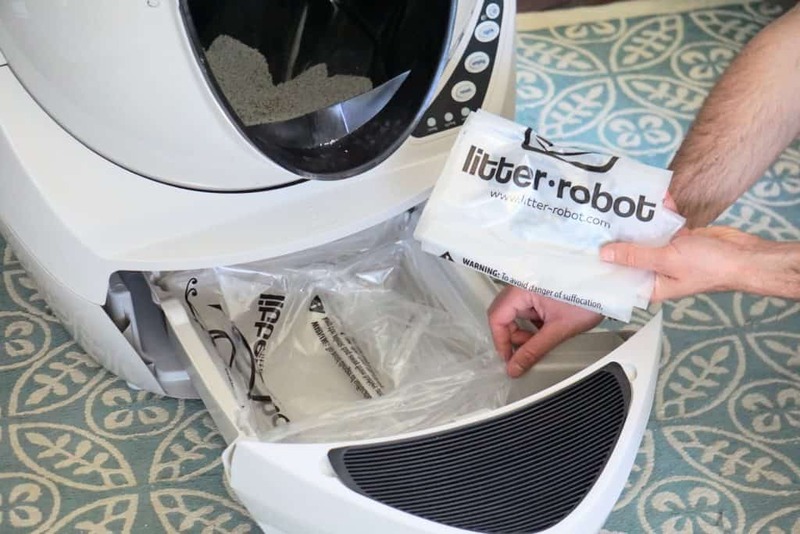 Are YOU ready to make the switch to using Litter-Robot? 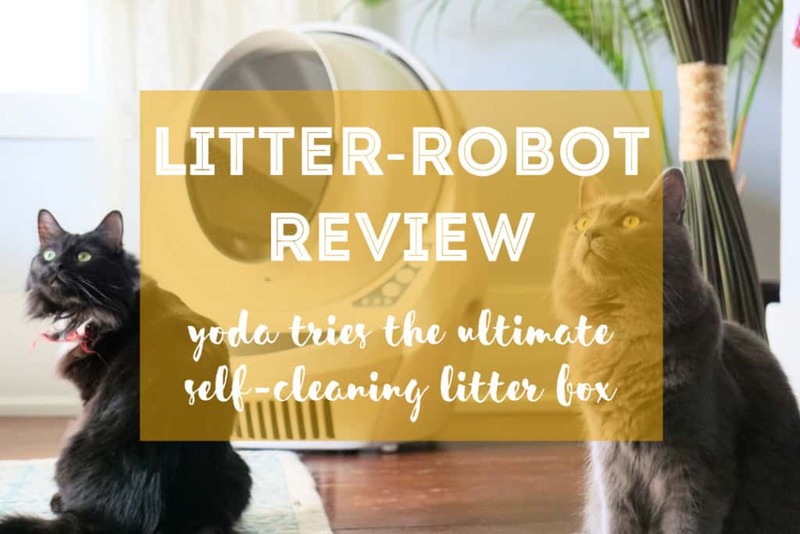 Yoda and his friends are having a blast with the Litter-Robot and we cannot be more relieved to not have to scoop out poop and pee anymore! 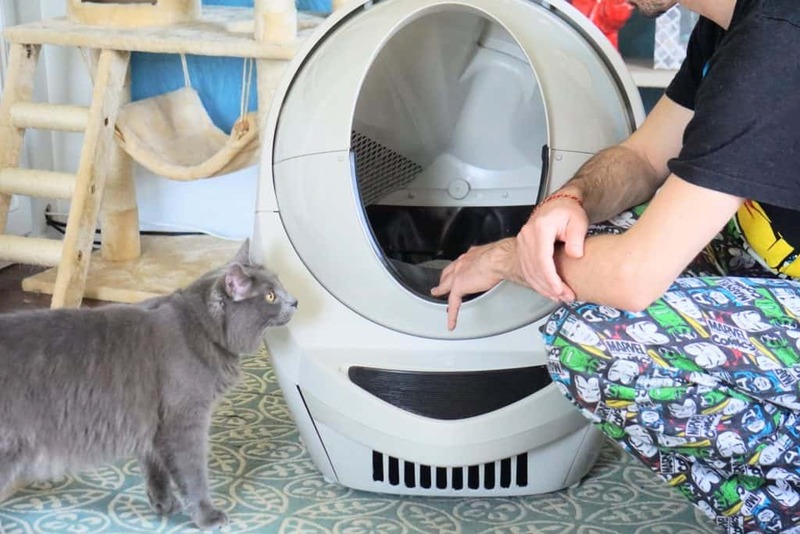 A big thanks to Litter-Robot for the oppawtunity and thanks to Yoda and his fluffy cousin Dexter for being such great meowdels. 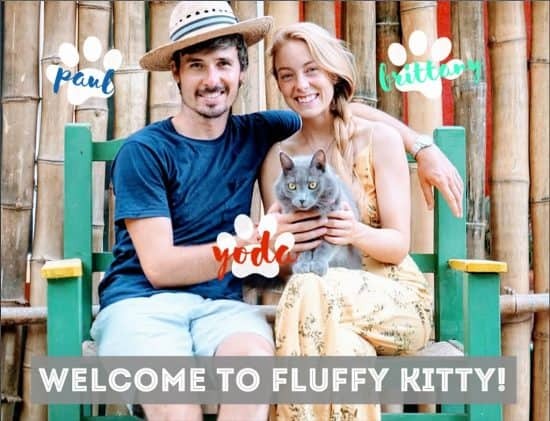 Don’t forget to follow both Litter-Robot and Fluffy Kitty on Facebook, Twitter, Pinterest and Instagram! Previous Post Is Neosporin Safe for Cats? Great review, thank you for writing this! Two big questions I’ve yet to find answers to: how often were you emptying the bin (vs. A typical litter box), and was it smelly at all? Bonus question: do you have to use their bags, or will any bags work? Hi Jamie! Thanks for reaching out. 🙂 My sister now uses the LR for her 3 cats, and she empties it once every 1-2 weeks. And it smells mainly when you open it to empty it, and she mentioned that it depends on which litter she uses. She uses the LR bags, washes them out and reuses them at least 3-4 times before tossing and replacing with a new one. But judging by its design, you could easily use an ordinary wide-mouth trash bag. It’s just got to be able to stretch around the tabs. Hope this helps! Thanks again and good luck!